In a move to sharpen the goalkeeping department, Kenyan Premier League club Gor Mahia recently hired the highly qualified Idd Salim as the new goal keeper trainer. Salim recently served as the U-20 Harambee Stars goal keeper trainer with the team that participated in an invitational tournament in South African. 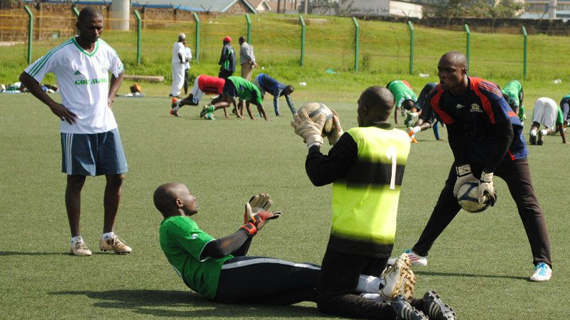 After a brief stint at Gor Mahia, the new goal keeping techniques introduced by Salim have begun to bear fruits. Those who have witnessed recent matches especially the encounter between Gor Mahia and Chemelil must have seen a different Jerim Onyango between the posts. The captain has been at the top of his game and strikers have been finding him a hard nut to crack. The club has the best keeper is the country in Ivo Mapunda, Jerim Onyango and Wycliff Kasaya. With no nonsense coach Logarusic introducing a new system of play to the up field players, the goal keeping department also needed a new approach, a challenge that attracted Idd Salim to the club. In an exclusive interview with michezoafrika.com, coach Idd Salim says he excited about his new job and looks forward to injecting new skills to bring out the best from the keepers at K’Ogalo stable. Salim has done his own research and believes he has a solution to the below par performance by Kenyan goal keepers that has also hindered their progress to top European clubs. Idd Salim has a wealth of technical experience and management skills that he hopes to impart to his trainees. He holds several coaching qualifications that includes: CAF A license, CAF B license, Advanced Dutch Level 1, Brazil Tetra, and a Fitness and Gym Certificate from Kenyatta University. Idd Salim started playing competitive soccer while in Primary school for a club called Nyoka FC .While in class 6 his team won the Provincial Division 1 title. He then joined Young Rovers in Division 1 where he featured until 1994 when he completed his primary studies. In 1995 he progressed to Mombasa High. He quickly managed to cement the number one position in the school team and was the keeper for the teams that won the national championship in 1996 and 1998.The school emerged as runners-up in 1997. After high school he joined Kenyan Premier League side Utalii FC and then progressed to Uganda for a brief stint with Mbale Football club. He hanged his gloves in 2000 to concentrate on professional coaching. He started training kids and organizing events. In 2007 he guided the Kenyan team to Danone Cup in France. During this tournament upcoming Kenyan midfielder Paul Thiong’o who currently is at Empoli Youth was discovered. To gain practical experience in goal keeper training, Salim was attached to Dutch side AZ Alkmaar Football for 6 months then proceeded to Italian Serie B side Empoli for another 6 months of experience. He is also an ambassador of Ubabalo Africa, Aspire Academy Coordinator and has also worked as regional coordinator for Sakata ball.